...Andy, but by no more than a couple of minutes. As I'm twizzling my combination lock out the front of Moss Bros, he's already ordering the "safari special". Care to stick your neck out and guess? That's right, it's an ostrich bap, fully in keeping with a man who had the zurek and lived. I'm also a special -- aren't we all? -- though mine's the far more Cameronesque tuna melt. 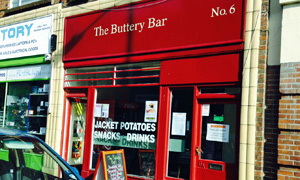 Oh, this is the Buttery Bar on High Street, formerly Appetisers (mentioned in passing), up the road from the estimable Museum Street Cafe. If you're still hazy, we're opposite Ann Summers. There, now you know. Ostrich, says the cheerful Baron Buttery, has a very low fat content, and is far easier to obtain than, say, venison. Not as dear, either. Must be that seven mile stretch since I'm famished and mighty glad to tuck in to my tasty toasty. I put it to you that there is no finer accompaniment than an iconic packet of tomato Snaps, which continue to MIYM, and a 500ml bottle of Sunmagic blood orange juice drink from the impressively stocked fridge. While the office crowd queue up for their hot rolls and paninis and sarnies, we're soaking up a squint of sun on our window stools. Door's open and adorned with posters for Three Lions at the New Wolsey and a Dylan Moran tour. Life seems highly satisfactory with a bellyful of competitively priced luncheon. Sweet stuff ain't their speciality, adds the Baron. Nonetheless, there remains a single last piece of fresh cake -- a man-slab of cherry flapjack -- until Andy stamps his name all over it. I'm not fussed since there's a plethora of perfectly fine prepacked bars (mental image of Garnett's) inc. a really rather good Rocky Road. Coffee? Won't be good. Expect the worst, they say, and the rest of that particular aphorism I completely forget. True to form, it's not half bad at all, courtesy of a quality looking machine round the back. Good solid performance from the Buttery brigade. If it was a car -- Vauxhall Corsa Sting. If they were passing by -- Sergeant Danny Butterman.